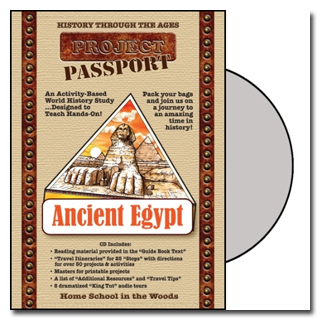 We reviewed Project Passport World History Study: Ancient Egypt by Homeschool in the Woods. I have read much about Home School in the Woods, but always shied away from the curriculum, because we just aren’t lapbook kind of people. I should probably clarify and say that mommy isn’t really a lapbook kind of person. Despite that, the many times I’ve visited the Home School in the Woods website, there has always been a lapbook topic that has caught my eye and the company makes lapbooking look fun. We were given the opportunity to review the Project Passport World History Study: Ancient Egypt. The curriculum is geared towards students in the third through eighth grades, so a family with a wide age range of children would be able to complete the material together. This Home School in the Woods lapbook takes your student through the ancient land of Egypt as they learn about the architecture, art, government, music, religion and more of that period. Some of the covered information includes The Egyptian calendar; their beliefs on the Creation and the afterlife; mathematics; The Rosetta Stone and more. The lessons are available on a CD or as a download, which we received and is easily saved. One of the things I really like about Homeschool in the Woods curriculum is you don’t have to hunt for the specific material that is needed to complete the lesson. Everything is laid out well and labeled. The files that are needed are provided as PDFs. There are 25 stops on your journey through Ancient Egypt and each one has lessons that apply. The introduction provides detailed information as it walks you through what to expect over the study period. Homeschool in the Woods includes the curriculum as well as a list of all of the pieces needed to complete the lapbook. Yes, you do have to print it to use it. Another cool feature is the list of covered material presented in the introduction links to whatever page it is referring to. So, again, you don’t have to hunt for the pieces you need to complete the curriculum. Everything is referenced and you click on the link when you are ready to use or if you prefer to put all of the lessons together before starting. We have been studying American history and taking a break to tour Ancient Egypt was fun. We spent about one week on a stop. All of us really liked the timelines. Timelines are interesting, because they provide a quick walk through history as it notes significant events. I know there are a lot of other things that happen that may not get mentioned, but they are a great reference for quick date-specific events. We spent more time on the writing assignments than we did on the crafts. There are a number of projects to work on, but I wanted to get more of the history. My children also liked the MP3 audio stories that are included. As I stated earlier, lapbooking is not a favorite of mine. Okay, I have a love-hate relationship with lapbooking. I love the idea, but sometimes, all of the crafting and hands-on gets to be a bit much. Granted, you don’t have to do everything. I found that preparing the lessons ahead of time and telling my children what were going to do instead of allowing them to pick and choose projects for each lesson, that gave me more control over our time and reduce the amount of preparation for the lessons. I eventually allowed them to go through and work on the hands-on projects they found interesting. If you love lapbooking, you will definitely love Homeschool in the Woods. For the information that is included in the study, I would say the price is quite reasonable for a history curriculum that you could probably finish in a few weeks or use it as the foundation/spine for the suggested eight to 12 weeks the subject. Hey, you don’t have to be a fan of lapbooking to use and enjoy this curriculum. 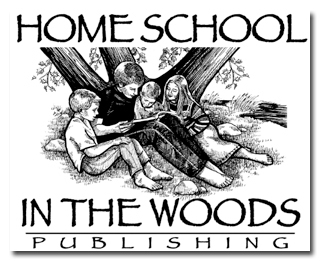 Home School in the Woods is available for $33.95 as a download and $34.95. 95 on CD.